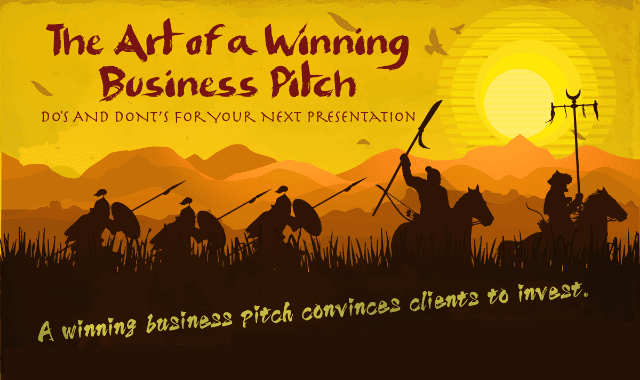 The Art of a Winning Business Pitch: Do’s and Dont’s for Your Next Presentation #Infographic ~ Visualistan '+g+"
For the business world, you have to carefully plan a way to win your client’s investment over your competitors. Your ticket to victory? It’s your presentation. If you’re tempted to overlook this important tool, think again. Too often, we see text-heavy, bullet-pointed slides, because presenters forget that their PowerPoint is the first thing everyone looks at. Here’s an effective way to prepare, based on an ancient strategy manual made relevant to businessmen.